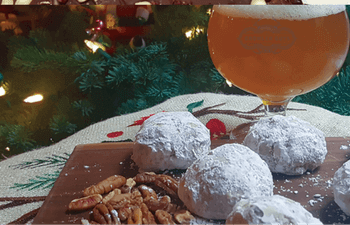 Pretend it’s a White Christmas and leave Santa a tray of traditional Snowballs and a bold Imperial IPA for him to wash down after he drops off the gifts. – Pre-heat oven to 325°F. – Combine all ingredients except powdered sugar in bowl. Beat at low speed, scraping bowl occasionally, until well mixed. – Shape dough into 1-inch balls. Place 1 inch apart onto ungreased cookie sheets. – Bake 18-25 minutes or until very lightly browned. – Cool 5 minutes; roll in powdered sugar while still warm and again when cool.